– Ed L. Bousfield & Paul H. LeBlond, Pipefish or Pipe Dream? 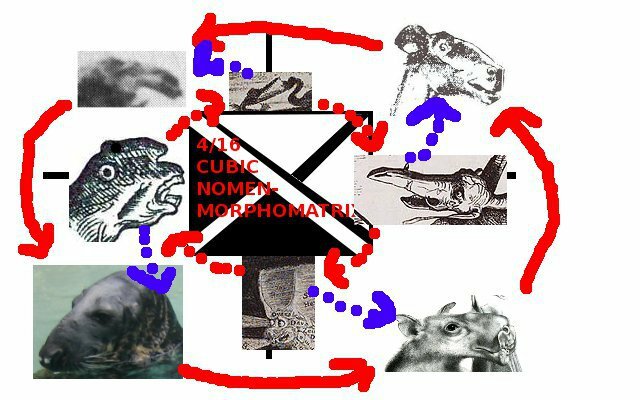 Spatio-temporal quantum phenotype “type” manifestations of Dæmoneojersianus nomen-complex. Rightenover: Dæmoneojersianus brunetii sp. nov.; Down-Bottom: Cadborosaurus willsi (LeBlond & Bousfield 1995) Nomen Nudum; Leftmost: Hypsignathus monstrosus Species Inquirenda; Also Depicted: Halichoerus grypus Nomen Oblitum. Through the sands of Time immemorial, Mankind have run afoul of Hippocephali even a child could distinguish from the familiar Equus. The close-minded Modern Linnaeusists brush “Halichoerus grypus” under the rug under the label “seal” and clumsily force “Hypsignathus monstrosus” into the pigeonhole “bats”. But how can species with the heads of horses be spread across entire distinct Orders of Mammalia? They cannot be. 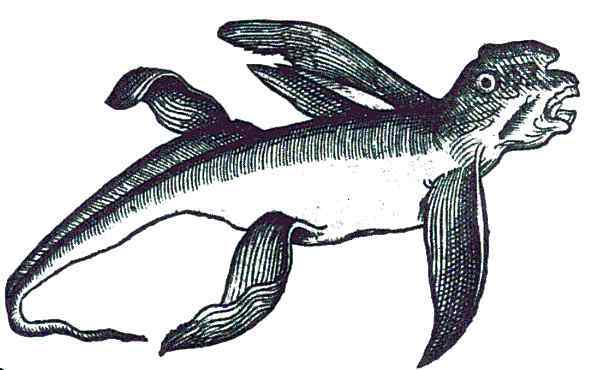 The Cult of Taxo-“nomists” haughtily look down upon LeBlond and Bousfield’s “Cadborosaurus willsi” – that brave and noble classification which tragically fell upon deaf ears – and none but myself have the courage to describe Dæmoneojersianus brunetii (sp. nov. – this paper). It is clear these Phylo-infected “taxonomists” care more for making genetic “information” dance like a puppet on its strings at their whims upon gels than a True classification. Only I have the bravery and aptitude to classify Animalia, as I will heretofore demonstrate. Holotype and Lectotype of Dæmoneojersianus brunetii. Diagnosis: Classic Hippocephalic condition; Limb pair I/II clearly distinguished; cranial appendages; neck flexibility characteristic of amphicoelous cervicals; trifurcate (fluke-like) caudal appendage. – Malte C. Ebach, Marcelo R. de Carvalho, & Silvio S. Nihei, Saving our science from ourselves: the plight of biological classification. Syntype of Dæmoneojersianus brunetii sp. nov. Diagnosis: Hippocephalic condition; cranial appendages; pseudo-ziphiid condition; Limb pair I/II fusion; manus reduced to digits II, III, & IV; flukes absent. What these Skeptics and Debunkers trot out as “fossil” “evidence” is but a fool’s dream. How can bone turn to stone? No more so than a barnacle could transform into a bird! The objects known as fossils were carved by the Victorian Sentinelese to fool Sir Richard Owen into believing a “pre”-history; the Sentinelese now reign in the Earth’s Core, waiting for Humanity to grow weak and flabby from belief in “Evolution”, and then they will strike. For more on our would-be overlords and other wonders please consult Bühler’s Subterranea Victores et alia Mirabilia, of which I have the only copy extant. [I]n animals that metamorphose, the basic types of larvae originated as adults of different lineages, i.e., larvae were transferred when, through hybridization, their genomes were acquired by distantly related animals. Syntypes of Dæmoneojersianus brunetii. Diagnosis: “Cadborosaurus” form ontology as follows: 5 humps, 5 loops, 4 loops, 1 hump, serpentine/crocodilian. Fluke structures and heads shared in both life-stages. Paratype of Dæmoneojersianus “The Danish Sea-Monkey” type I/II transitional form. Diagnosis: Cranial appendage; Limb pair III fused into long “tail”; Hippocephaly mildly developed due to juvenile condition. What is the Ultimate Species, that which for the whole process of Creation set in motion by our Space-Progenitors was for? Is it man with his enlarged forebrain, well-developed buttocks, and ability to travel to the moon? No, for Man is weak and easily overpowered by the lowliest female orangutan. Is it the bacteria – the Chaos infusorium of Linneaus – with their infinite adaptability and fast generations? No, for even Man will surely ever hold them at bay with His chemical concoctions. No, the ultimate species is so Ultimate for the recognition it does not get, except from those smartest of humans. It allows itself to be seen under certain guises, yet adopts others so probable only a fool could believe them. When it is too often seen, it transforms into another beast with no seeming connection. They can never be caught, or if they are seemingly so, leave but a shell for plodding Man to find and ponder over. It is only the wisest of us that can see them, see the patterns. I am smarter than everyone, and no doubt myopic fools will assail my monolith of logic with their “Razor of Ockham” and their “Causality” – and it shall be their DOOM! Proc Natl Acad Sci U S A. 2009 November 24; 106(47): 19901–19905.